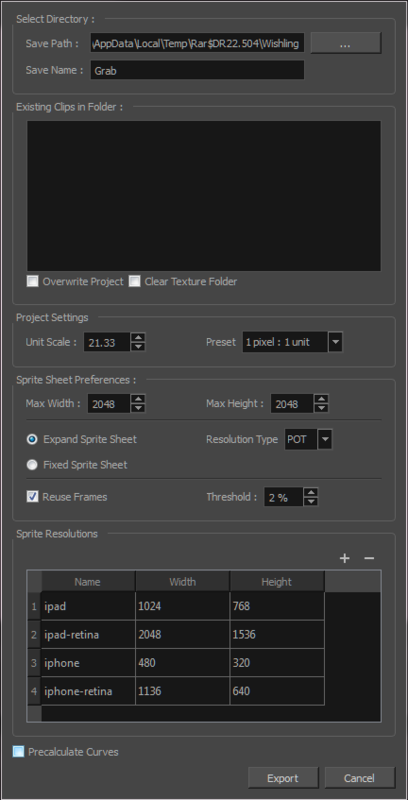 The Export to Sprite Sheets window export to multiple resolutions, generating multiple .xml files and one or multiple sprites sheets depending how many sprite resolutions you defined. This saves different animations of the same character into the same name. For example, if there's an idle, run, and jump animation, these should all share the same Save Name. You can think of it as the overall collection of animations. Inside are the different saved scene versions whose drawings you can reuse for all the animations in that character set. Each scene version will be displayed as an item in the list. If you saved multiple animations to the same Save Name (i.e. SpaceDuck: run, idle), then it will reatlas the sprite sheet to include all the drawings from all the animations in that folder, creating a new animation file, but reusing the same skeleton. Click the Export to Sprite Sheets button. The folder path where you want to save your export. The folder name in which you will save your export. This will also be the name of your asset in Unity. Your scene file name will be used as the clip name. Removes any information from the texture folder within the Harmony file. This has no incidence towards the Unity export but contributes to a lighter Harmony file. Lets you change the scale when exporting to Unity to accommodate the size of the export without it affecting the Harmony scene. This helps you resize assets properly for Unity without having to resize them in Harmony. The basic scale is one Animation Field for one Unity unit. Makes linear values for interpolation. This increases the amount of memory used but frees up the calculation so it is not done on the fly. Size of the render of the individual sprite, when it exports each drawing out.